A contract has been awarded to the Transport Research Laboratory (TRL) to carry out the tests of vehicle “platoons”. Up to three lorries will travel in formation, with acceleration and braking controlled by the lead vehicle. But the head of the AA said platoons raised safety concerns. In the platoons, the lead vehicle will be controlled by a human driver and will communicate with the rest of the convoy wirelessly. The following vehicles will be instructed to accelerate and brake by the lead vehicle, allowing the lorries to drive closer together than they could with human drivers. Lorries driving close together could reduce air resistance for the following vehicles, as the front lorry pushes air out of the way. This could lead to fuel efficiency savings for haulage companies, which Transport Minister Paul Maynard hopes will be passed on to consumers. The following vehicles could also react more quickly to the lead lorry braking than human drivers can. However, human drivers will still steer all the lorries in the convoy. The TRL will begin trials of the technology on test tracks, but these trials are expected to move to major roads by the end of 2018. The government has been promising such a project since at least 2014. 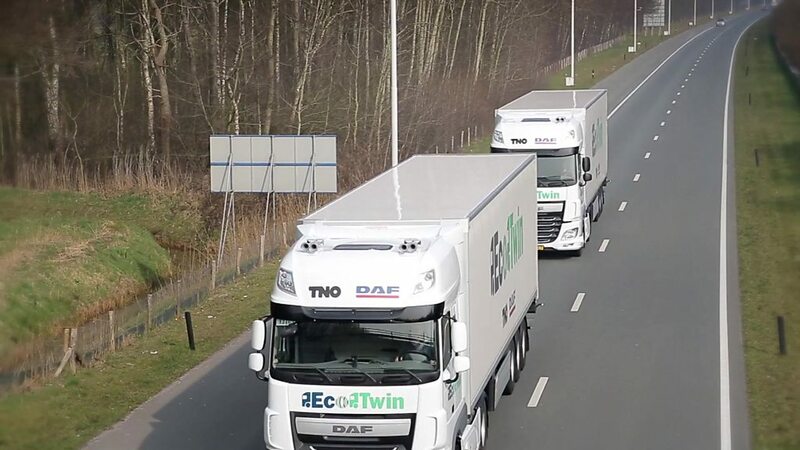 Last year, for example, it announced its intention to carry out platooning trials but was later frustrated after some European lorrymakers declined to participate. A Department for Transport spokesman told the BBC that the experiments are now expected to go ahead as the contract had been awarded. Will the platoon block motorists trying to leave or enter the motorway? The TRL says it will carefully choose sections of motorway for its trials, taking the number of junctions and traffic into account. All the lorries will have drivers behind the wheel who will be able to take control and break up the convoy to let other drivers join or leave the motorway if there is an obstruction. What happens if a car tries to squeeze between the lorries? The platoon lorries will be able to drive more closely together than those driven exclusively by humans, so the gap between them might be uncomfortably close for a driver to try to squeeze into. However, the TRL says its current strategy is to break up the convoy and let the human drivers take control, if a car squeezes in between the lorries. The organisation is considering ways of informing other road users that the lorries are in a “self-driving” convoy. How much fuel will a convoy actually save? According to TRL, other trials have seen improvements in fuel economy of between 4% and 10%. A local trial will help determine the benefit platooning can deliver in the UK. Platooning has been tested in a number of countries around the world, including the US, Germany and Japan. However, British roads present a unique challenge, said Edmund King, president of the AA. “We all want to promote fuel efficiency and reduce congestion but we are not yet convinced that lorry platooning on UK motorways is the way to go about it,” he said, pointing out, for example, that small convoys of lorries can block road signs from the view of other road users. “We have some of the busiest motorways in Europe with many more exits and entries. “Platooning may work on the miles of deserted freeways in Arizona or Nevada but this is not America,” he added. His comments were echoed by the RAC Foundation. Campaign group the Road Haulage Association said “safety has to come first”. Transport Minister Paul Maynard said platooning could lead to cheaper fuel bills, lower emissions and less congestion. “But first we must make sure the technology is safe and works well on our roads, and that’s why we are investing in these trials,” he said.